Sam Lawson’s new book “Reflections” is an informative work on the lessons budding businessmen and politicians should think about as they move forward. 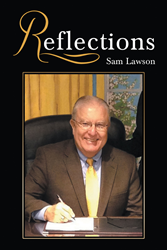 Recent release “Reflections” from Page Publishing author Sam Lawson is a helpful book that introduces concepts and possible stumbling blocks that aspiring businessmen and politicians should think about and could apply in their journey toward their goals, which are based on the author’s experiences in business and politics for more than forty years. Sam Lawson, an expert in sales and the art of motivation who has risen from being a sales manager to an owner of sales representative company and farm equipment business, has completed his new book “Reflections”: a thought-provoking book that introduces readers to the world of operating a political campaign and making businesses thrive. Published by New York City-based Page Publishing, Sam Lawson’s enlightening work also includes actual marketing documents that show how the author has been able to make his business dream into a reality and the business tools one can use for his or her business to be successful and unique compared to competitors. Readers who wish to experience this appealing work can purchase“Reflections” at bookstores everywhere, or online at the Apple iTunes store, Amazon, Google Play, Kobo or Barnes and Noble.